Alissa will be on the Food for Thought stage at the Food Fair discussing her debut book, Salt & Time. An evocative storyteller, Alissa will transform your perception of the food of the former Soviet Union. Alissa Timoshkina came to the UK in 1999 from Russia to study and never looked back. Gaining a PhD in film history, she lectured and published on the subject of Russian and European cinemas, and also worked as curator and coordinator of film festivals in London. 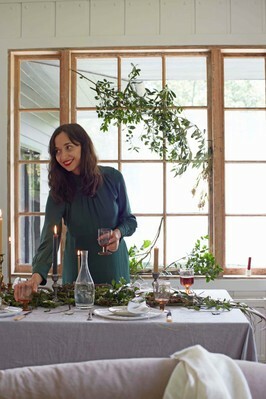 However, her passion for cooking and hosting dinner parties, gradually turned into an obsession and Alissa left her job to launch a new project: a cinema-supper club called KinoVino, which offers film screenings and sit-down dinners with unique menus inspired by films. Since its launch in May 2015, KinoVino has established a reputation as one of London’s most original projects, redefining the local food and film scene. Featured in British Vogue, Olive magazine, Vice, The Curious Pear, Khoollect, the Telegraph and on BBC Radio 4’s Food programme, KinoVino was named one of the 10 best supper clubs in London by Time Out. Alissa has also launched a private events branch of KinoVino, organising product launches and private gatherings. She regularly holds food popups and supper clubs where she explores the cuisine of the former Soviet Union. Alissa was also shortlisted for the 2017 Young British Foodie Awards.